I decided to make another card for the GKD Party Release Challenge at Stamp TV. We are to use 3 different ink colors. Since I had the colors Memento Bamboo Leaves, Peanut Brittle and Teal Zeal and GKD Stippled Nature stamps on my work counter, I used them again but added some Patterned Paper from GKD Autumn Landscape pad to the Grass Green card base. AAA Cards: Game #65 Birthday. 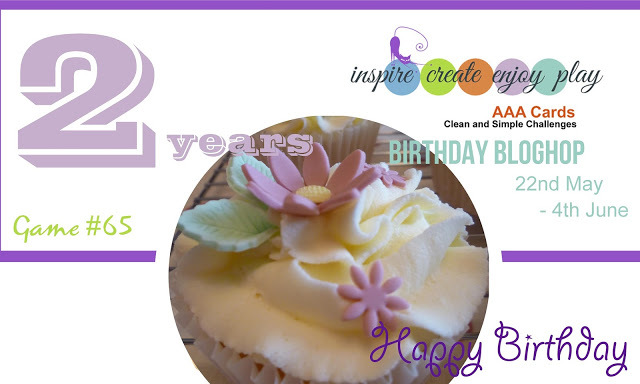 Happy 2nd Birthday to AAA Cards! Welcome to my studio. This card was made for the GKD Party Release Challenge at Stamp TV. We are to use 3 different ink colors. I chose to use Memento Bamboo Leaves, Peanut Brittle and Teal Zeal. 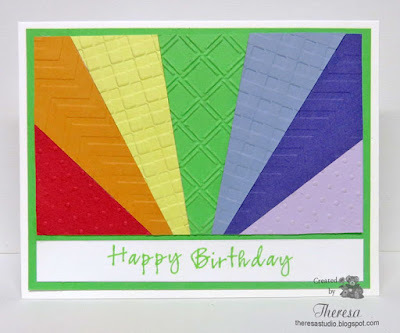 I used a GKD Stamp from Perfect Plaids that I have never used on a card and stamped 3 times on White CS with each of the colors. Using stamps from the Stippled Nature set, I added the flower and birthday sentiment. I attached this to a Card Base of GKD Grass Green CS. Finished with some touches of Sakura Stardust pen on the stripes and flower. 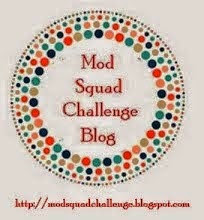 Mod Squad Challenge: Use It or Lose It-use something you have not used for a long time, rarely used, or never used. I used the plaid stamp that I never used. This was a card that just evolved with no real plan. Just pulled out the Perfect Plaid stamp and just started playing and came up with this design. Hello! 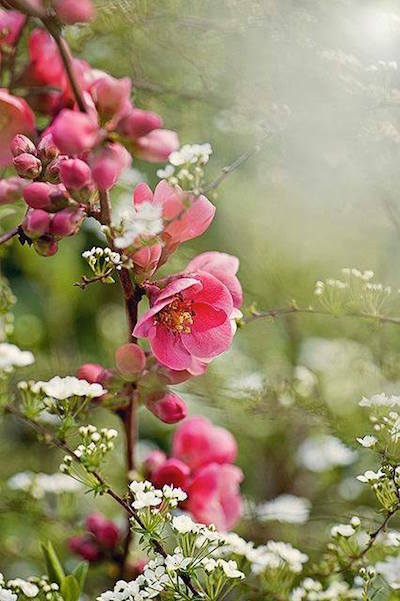 I am enjoying the beautiful colorful flowers of this spring. 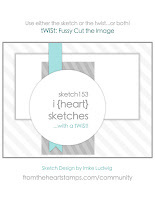 Today I am sharing a card made with From the Heart digital stamps Painting Ladybug and used their current Sketch Challenge #153...we are to use the sketch and /or twist of fussy cutting. I only used the sketch. I printed the sentiment using Photoshop to color and rearrange the words. Other supplies used: White, Green and Ivory CS, GCD Studio pattern papers, Circle Dies, Red Satin Ribbon, Copics. 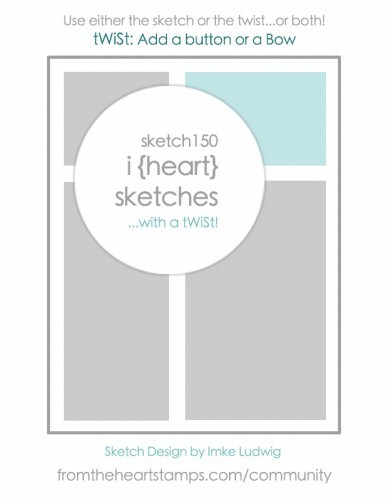 From the Heart: I (heart) Sketches with a Twist #153 on right. Hello! 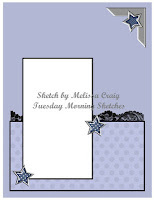 Today I am playing with a Sketch Challenge and Stamps from Repeat Impressions. I decided to use red, white and blue as my colors ....thinking of Memorial Day. 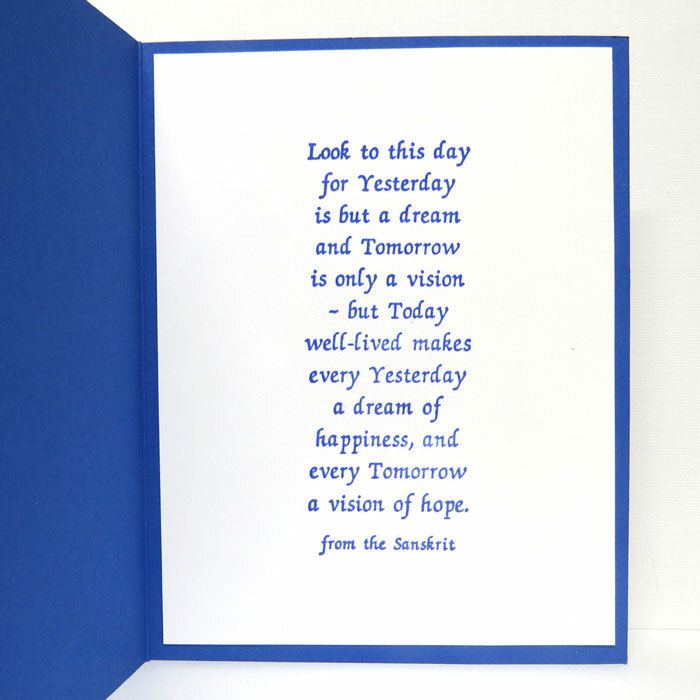 This card could be used for graduation or another type of celebration. The larger balloon was fussy cut and popped up with craft foam. Finished the inside with a favorite Repeat Impressions sentiment. Other Supplies: SU Brilliant Blue CS and Ink, White CS, Scraps of Red CS, Copics, EF Divine Circles. Hello! What beautiful weather we are enjoying! Today I have a card that I call Rainbow Burst, my variation of a Sunburst or Starburst Card. I made with scraps of GKD Red, Orange, Yellow, Green, and Blue CS's plus other unknown purple and lavender scraps. I arranged the rays on Green CS and on a card base of White CS. 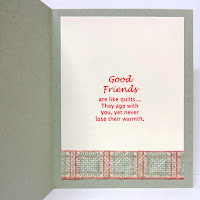 The GKD sentiment from Stippled Nature was stamped on a white CS Strip with Stampin Up Green Galore Ink. 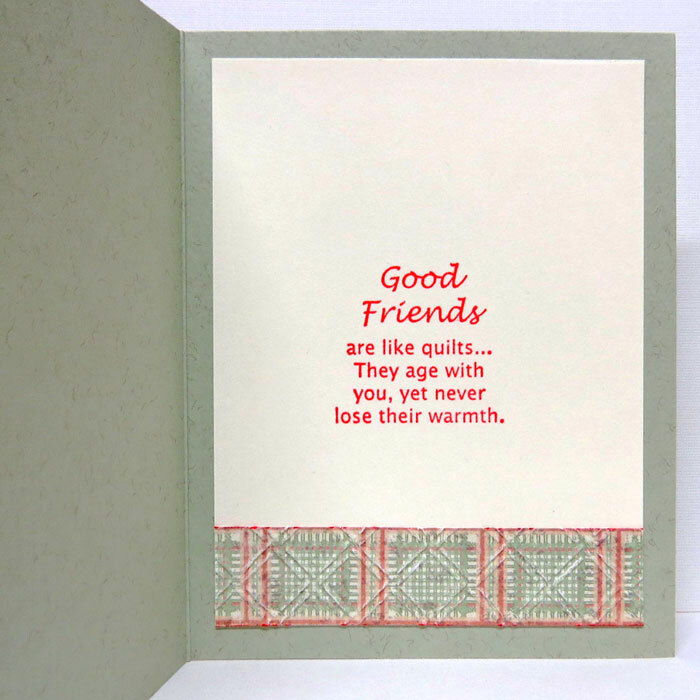 Embossing was done with Swiss Dots, Chevron, Gingham, and Wicker Weave EF's. 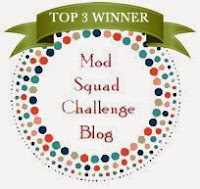 Mod Squad Challenge: Use It or Lose It. Use a product that you rarely used, or never used. I have never used the SU Green Galore ink....was still in original plastic wrap. I also seldom use the lavender and purple CS. Note: Several years ago about 2010, my husband gifted me with a SU Color Caddy full of SU inks. He had purchased it along with other items from a friend who gave up card making and sold all her supplies. I have never used some of the many inks including the Green Galore( never opened) which was the perfect green for this card and I just happened to find when searching for ink for this design. Hello! I have been MIA the last few days.....I have been visiting my Mother in TN and was away from making cards for a while. I am trying to catch up with some challenges and have to hurry with this post to meet the deadline at Mod Squad. This is a One Layer Card made with GKD Heart base CS because I can color with Copics and the ink does not bleed on the inside. Used smooshing with distress inks to create background. Inspired by the photo challenge at The House That Stamps Built. The blossoms are more pink in rea life....photo did not capture true colors. Supplies: Stamps from Flourishes Cherry Blossoms set, Sentiment from Repeat Impressions, Ink Memento Cocoa Brown, Distress Inks Peeled Paint and Tumbled Glass, Copics, GKD White CS. Mod Squad Challenge: One Layer Birthday. 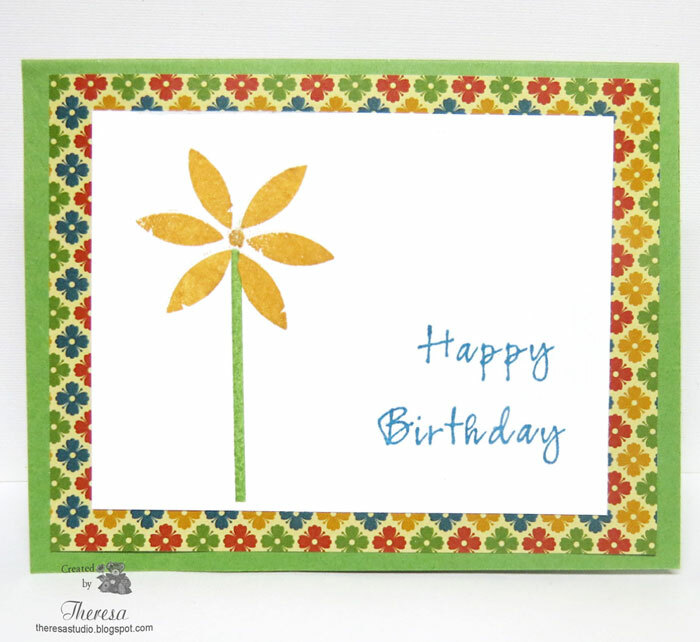 Used birthday sentiment inside. The House That Stamps Built: WIW Photo Challenge M1816. See below. 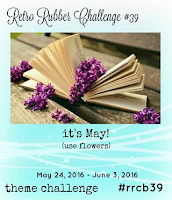 Retro Rubber: Challenge #39 May Flowers. Used Flourishes stamp set that I know was released in 2010 and I bought at that time. Repeat Impressions stamp is also over 1 year old. Hello! A few posts ago, I shared a quilt card that I made with a Blossom die and said that I wanted to create a design with 8 wedges for a Dresden Plate pattern. After working with a Silhouette file, I created a pattern for the size that I wanted. Using a pattern that I cut with the Cameo, I cut the design from scraps of ODB pattern papers and assembled the design and embossed it with EF Wicker Weave and attached to a Green Circle. Finished the design with circles cut with dies for the center. Assembled the card with a Green Card Base, an embossed (EF Gingham) layer of Ivory CS, and a Repeat Impressions stamp inked with SU Cameo Coral. Also used the complete stamp verse inside and another scrap of pattern paper. Circle dies are from Spellbinders and EF are from Cuttlebug. The House That Stamps Built: Challenge DCC511 is to use leftover supplies and papers. 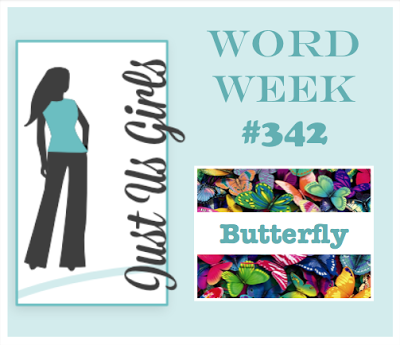 Tuesday Throwdown: #293 Thinking of You. 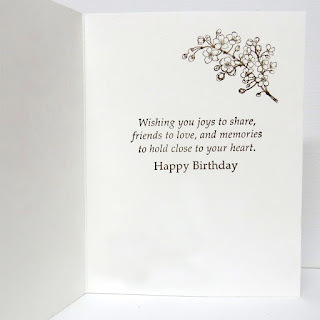 My card is one to send to a friend that you are thinking of. Crafty Catz: Challenge 324 Dies and Punches. Circle dies used. I bought this stamp sometime ago but I think this is the first time that I used it. I plan to make more quilt designs to use this stamp. Welcome! 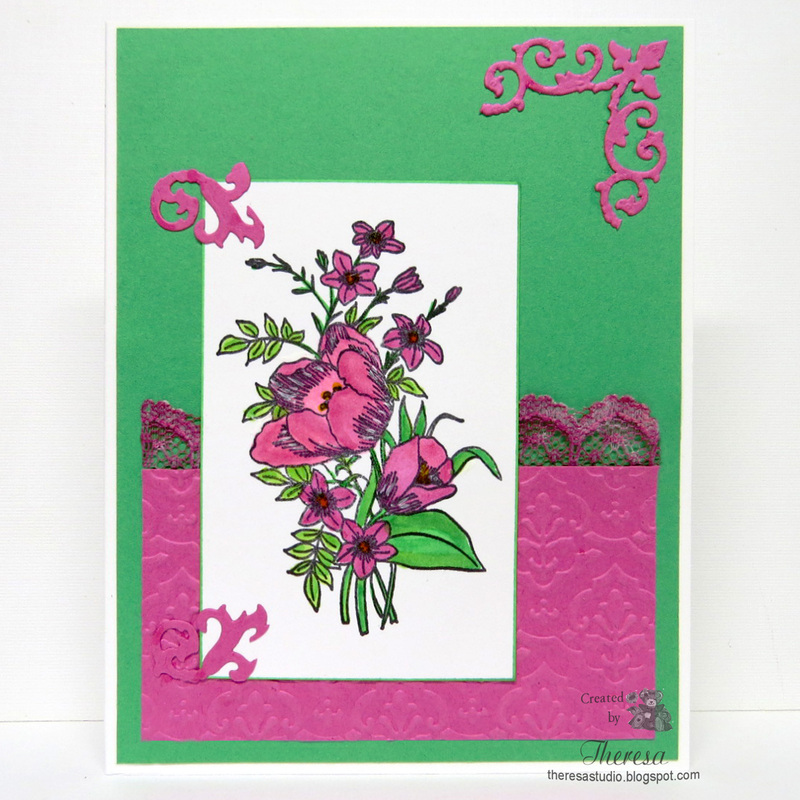 I just had to make another card with Flourishes Humming Along stamp set. 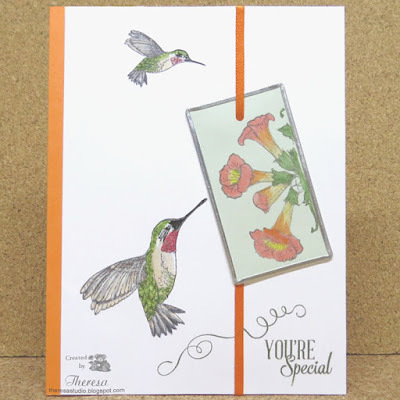 For my other Hummingbird card click here. This set was illustrated by Marcella Hawley and is one of my favorites. This time I wanted to feature the Honeysuckle stamp (stamped with Memento Espresso Truffle) along with the Hummingbird (stamped with Memento Tuxedo Black) . The images were colored with Copics and some Wink of Stella added to the bird for iridescence. Finished with a Yellow Satin ribbon and a green CS layer and Coral Card Base. I hope we will have a lot of Hummers stopping by to say Hello. 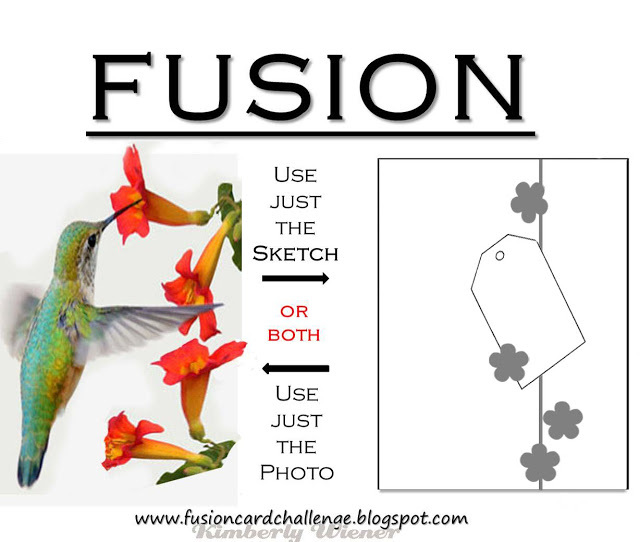 Fusion Card Challenge: Sweet Orange Blossoms. I used the photo inspiration for this card. Hello! 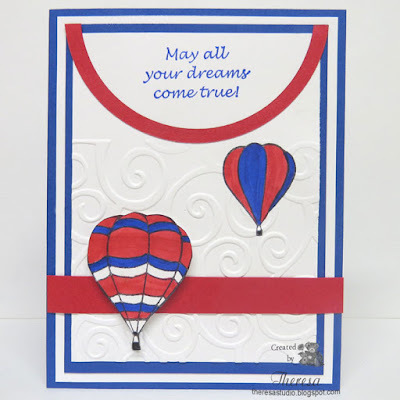 I created this card by casing the designer at Happy Little Stampers Case The Designer Challenge. I pretty much used the same layout and theme but changed the stamps and colors. 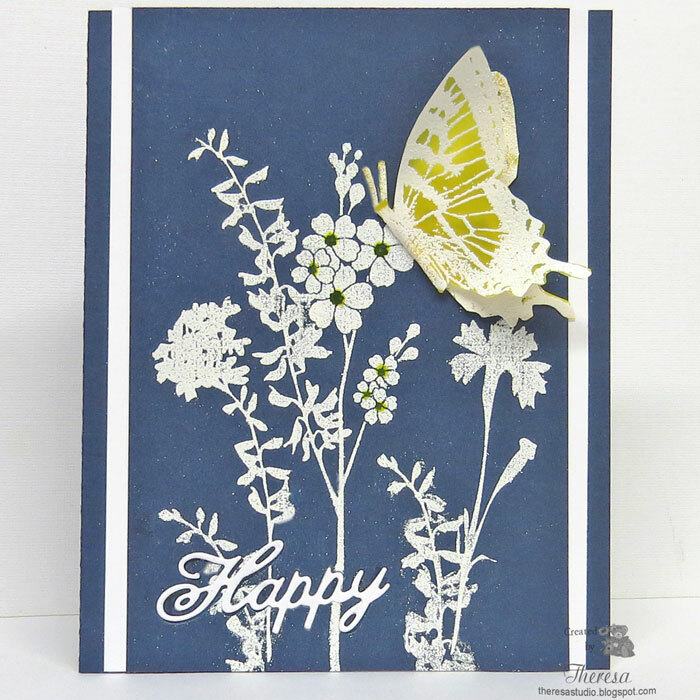 I used GKD Stamps from Elegant Flowers, Unforgettable, Tropical Flowers, and Hope Is Faith (butterfly) sets which I stamped with Versamark and embossed with White EP on Navy CS. I decided to leave some of the loose EP to give the background a splattered effect. Was that planned or by accident? Only the card maker knows! Added some interest to the flower centers with a Yellow Glaze pen. I stamped and heat embossed the Butterfly on Yellow Vellum and fussy cut it. 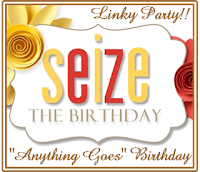 I used a Cheery Lynn Die to cut Happy from the image layer and then inlaid the word cut from White CS. 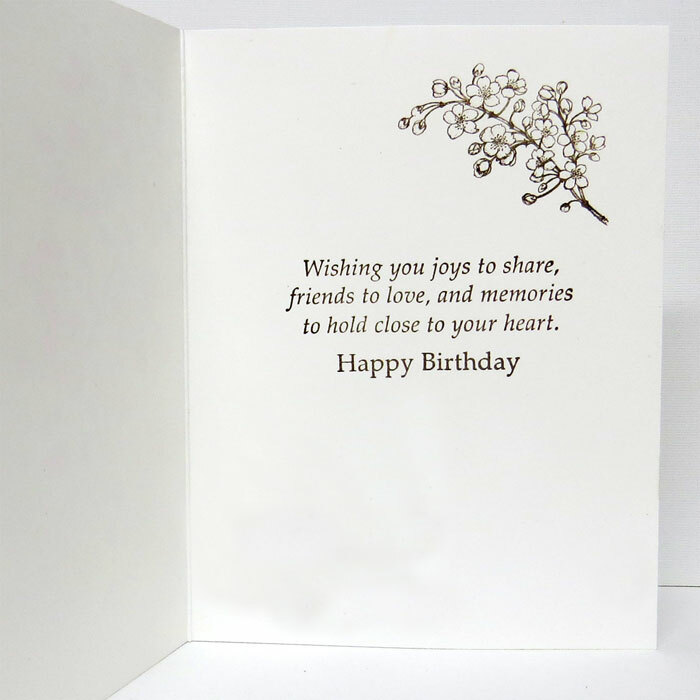 By using just the word Happy on the front, I can complete the inside to use for Birthday or other occasion. 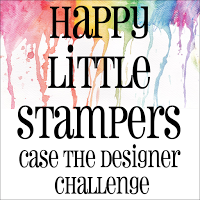 Happy Little Stampers: Case The Designer Challenge. The card to CASE is by Melissa Lane and shown below. Just Us Girls Challenge: #342 Word Week Butterfly. My butterfly was heat embossed and fussy cut. 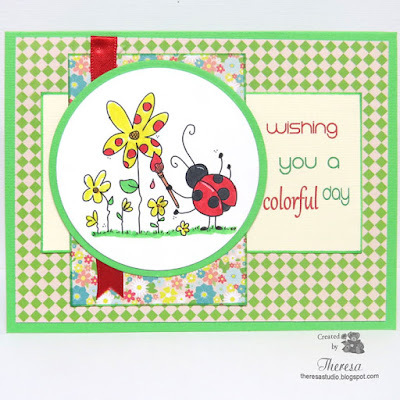 Stamp TV Mix It Up Monday: Picture Perfect Challenge-Use Cat's Picture as Inspiration. Hello! Happy Mother's Day to all Mothers......you are all so Special! I have ben playing with an old stamp set from Flourishes called Humming Along. I was inspired by the challenge at Fusion for both the theme, colors and layout. I found a "tag" or whatever it is framed with metal in my stash. I stamped honeysuckles with Memento Espresso Truffle ink on the frame and colored with Copics. 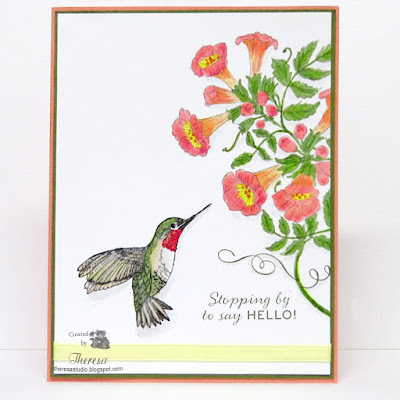 I stamped 2 Hummingbirds with Memento Tuxedo Black and colored with Copics and added some Wink of Stella and Stardust Pen to give some shine and iridescence to the birds. Hope you can see that. Attached the frame with orange satin ribbon and placed this on an orange card base but only showed the orange on the fold side. The sentiment is from Power Poppy Hens and Chicks by Marcella Hawley who was also the illustrator of the Flourishes stamps. I love Hummingbirds and have seen one already in our gardens. Time to get more feeders out. 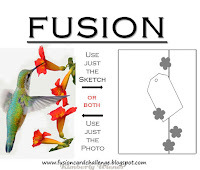 Fusion Card Challenge: Sweet Orange Blossoms. I used the sketch and photo inspiration shown left. 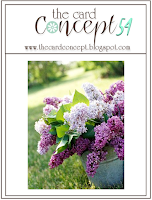 Tuesday Throwdown: Challenge 292 Welcome Spring. Hummingbirds are a sign that spring has arrived. Hello! 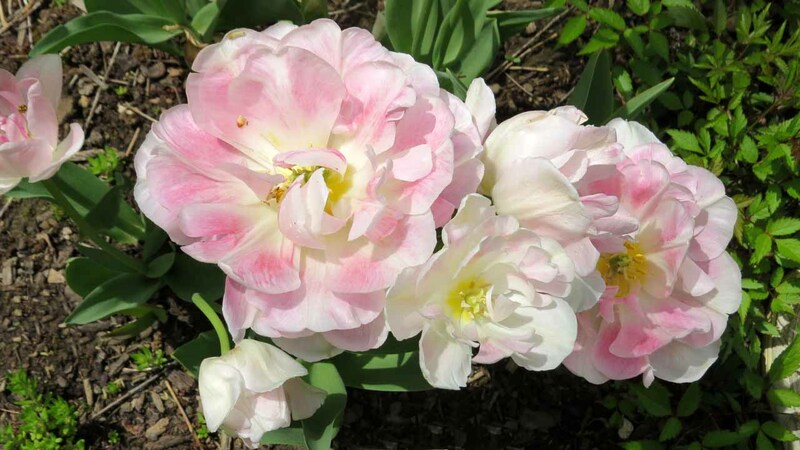 I have more tulips today. 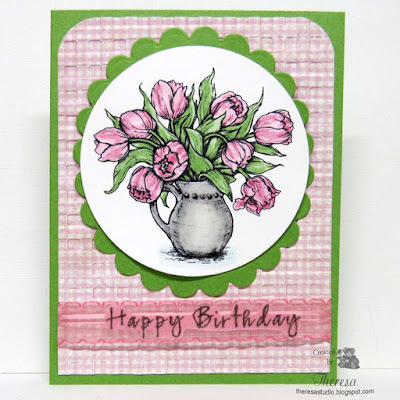 Today I am using a stamp from Repeat Impressions Tulips Bouquet that I stamped with Memento Tuxedo Black ink on white CS and colored with Copics to match the colors in the color challenge shown in the graphic below. I used some solid Pink and Green CS from a color pack that also match the colors in the challenge. Following a Sketch challenge from Tuesday Morning Sketches, I assembled papers with the image and added some Lace colored with a Copic and Paper embellishments die cut with Spellbinders Regal Frame dies. The pink panel was embossed with an EF from Embossalicious. 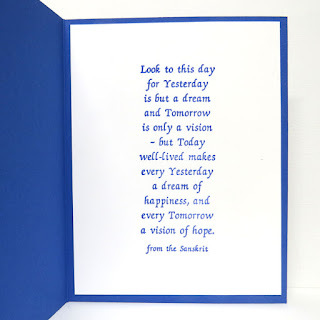 I decided not to use a sentiment on the front of this card but will use one on the inside. 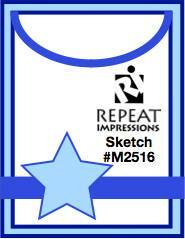 Tuesday Morning Sketches: Sketch 350 shown below. Crazy 4 Challenges: C4C335 Use emerald Green. Hello! 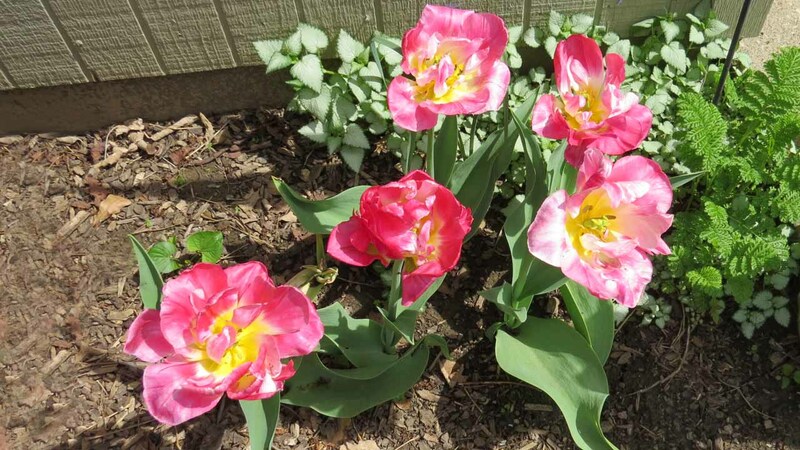 I still have beautiful tulips blooming ...some of the late ones seem to be staying longer than usual. 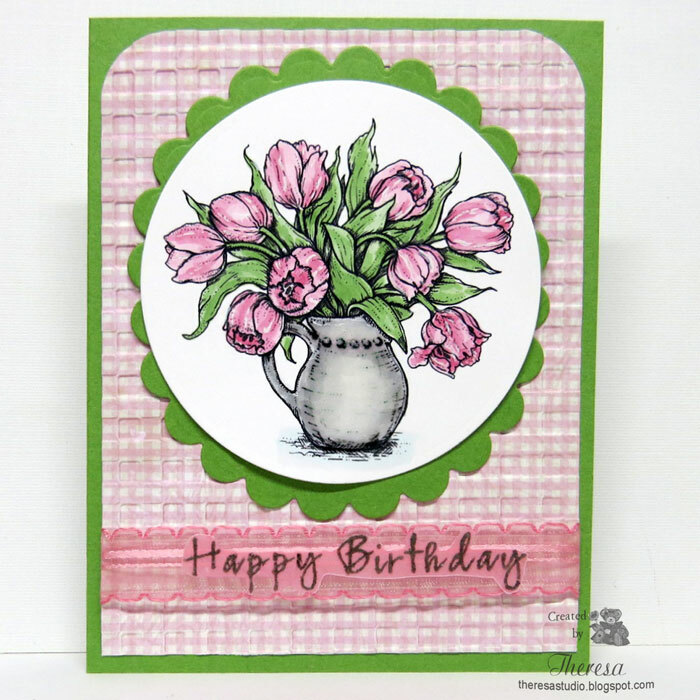 For this card, I used Power Poppy's digital image Tulips in Hobnail Pitcher that I colored with Copics and used Glossy Accents on the pitcher. 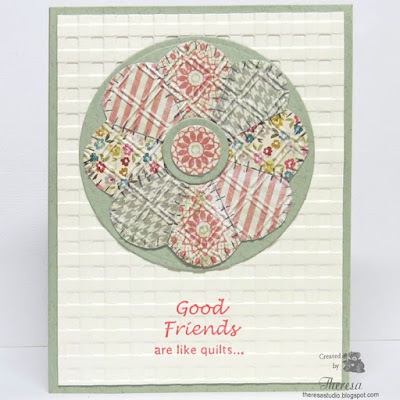 I cut with Nesties circle die and placed on 2 Green Scallop Circles arranged as an oval. I used an ODB gingham pattern paper that I embossed with Cuttlebug EF Gingham. 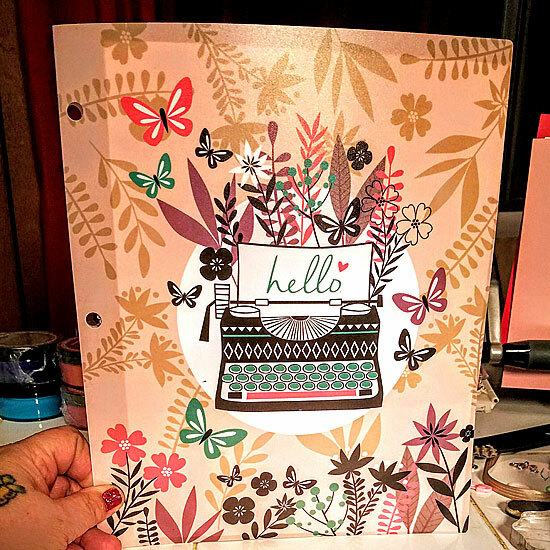 I love the effect of using pattern papers with embossing folders. The card base is GKD Grass Green CS and the Pink Satin Organdy ribbon is from my stash...one that I have been hoarding. I stamped the GKD Birthday sentiment on Pink Vellum with Memento Green ink and embossed with Clear EP. I trimmed the sentiment and attached to the ribbon with Vellum Tape as I wanted the ribbon to show. This color combo of green and pink is by far one of my favorites. 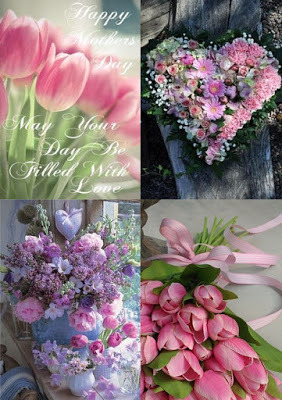 Double D Challenges: Happy Mother's Day/Happy Birthday-I was inspired by the pink tulips in the tile board shown below. 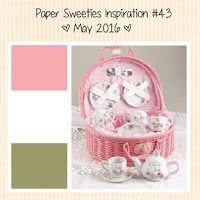 Paper Sweeties Inspiration Challenge: #43 May Challenge. 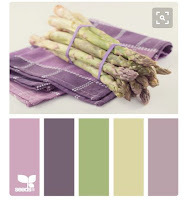 I was inspired by the colors on the Inspiration Board shown below. The Ribbon Girl Blog: May Card Challenge is Anything Goes with Ribbon. 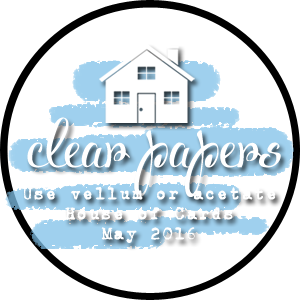 As You Like It Challenge: Which is Favorite - Patterned or Embossed Papers. 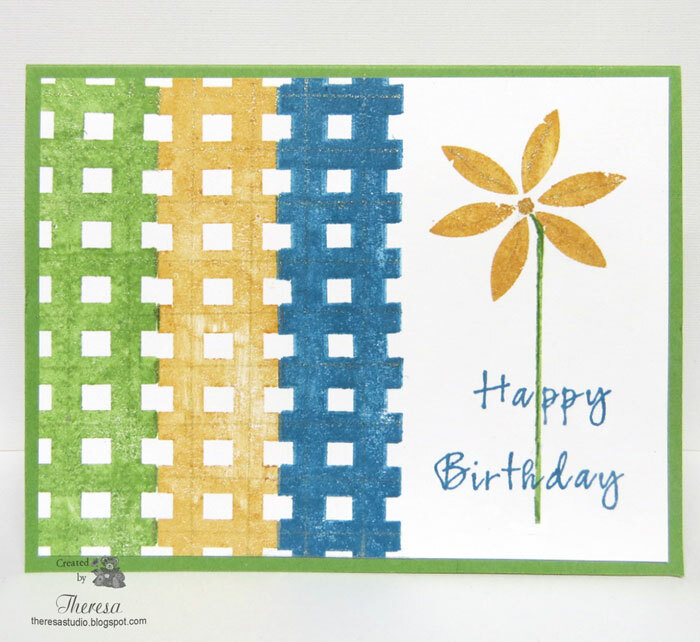 My favorite is combination of Patterned Paper that has been Embossed as I did in this card. This way I get the best use of both. 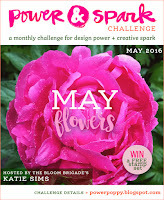 Power Poppy Power & Spark Challenge: May Flowers- reach for your favorite Power Poppy stamp floral and make it the centerpiece of your design. Hello! Lilacs are such a beautiful and fragrant blossom. We have a Lilac bush but it does not bloom every year....not very dependable. I printed Power Poppy's digital image of Lilacs in bloom on white CS and colored with Copics. 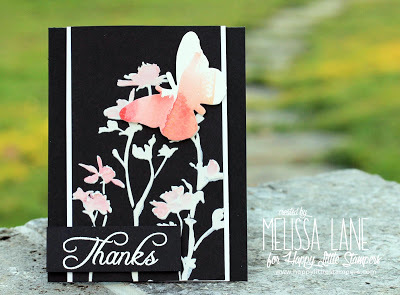 The Power Poppy Sentiment was stamped with Memento Pear Tart ink. 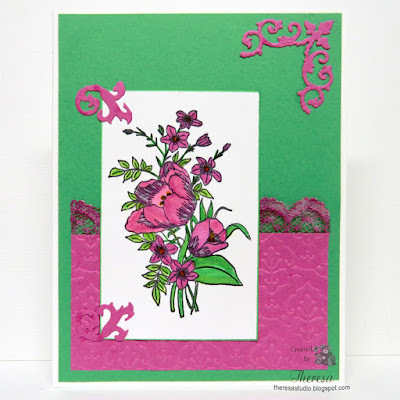 I place this on an embossed layer of the same green color and on a card base of Bazzill Lilac textured CS. Finished with a lovely satin ribbon that I won in a challenge and a handmade bow. 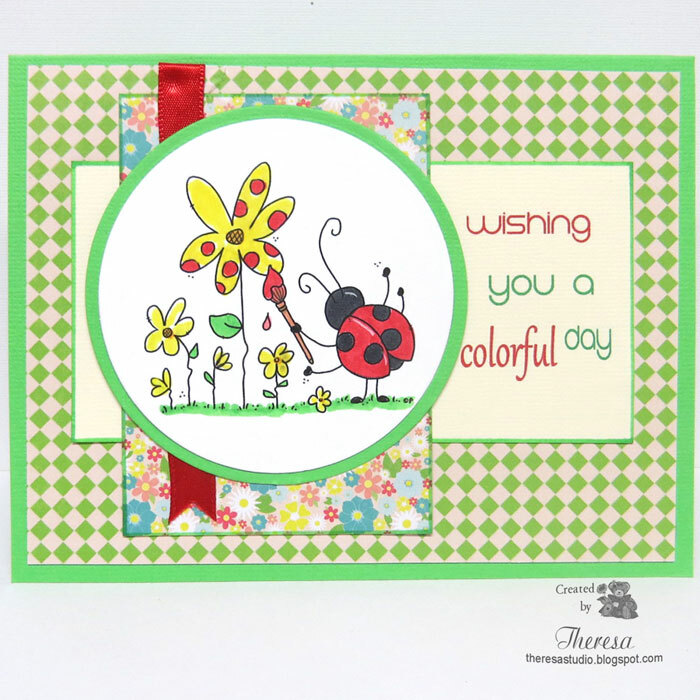 Don't you love the little ladybug on the leaf?...part of the stamp. 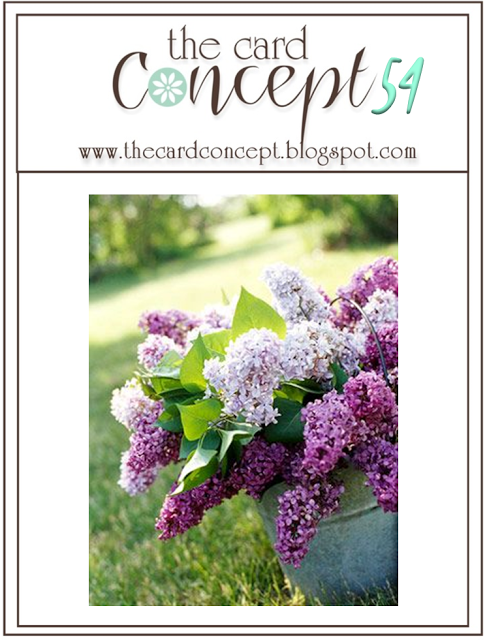 The Card Concept: #54 Spring Flowers-I was inspired by the lilacs and colors in the photo. My card is a Clean and Layered style. 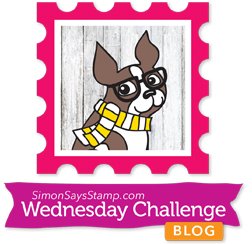 Addicted to Stamps and more: Challenge #192 Make your mark. Used Copic Markers. 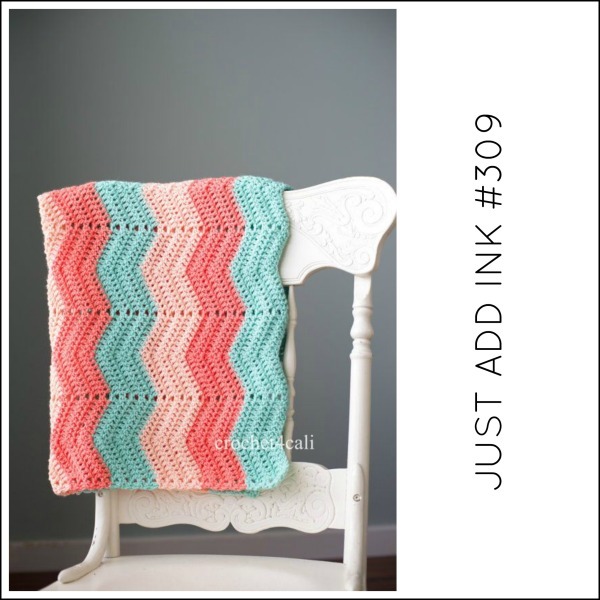 Fab n Funky Challenges: 303 Use 3 or more Layers. 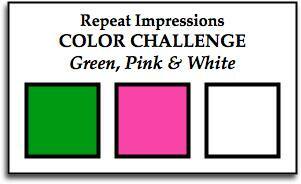 Crazy 4 Challenges: C4C334 Color challenge, See Below. Hello! 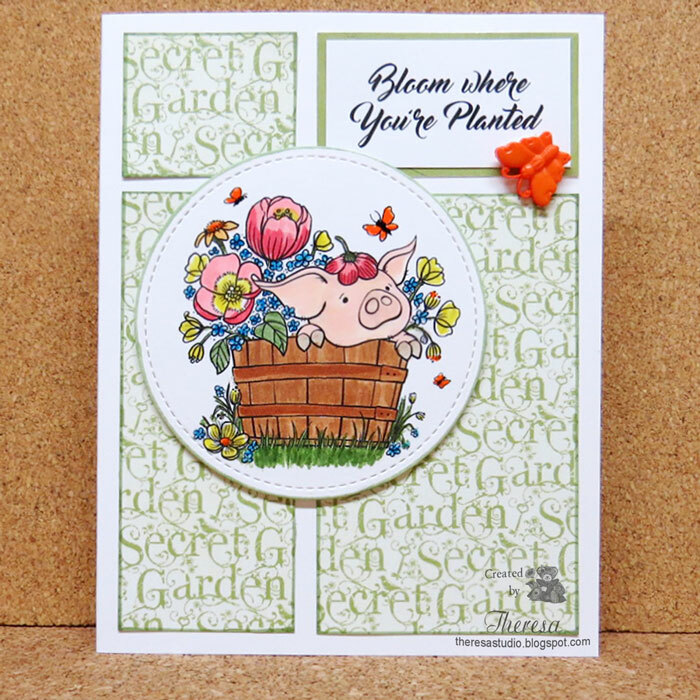 Today I have a card made with From the Heart stamp of the month Hamlet PigWit in the Planter. I received this stamp for participating in last month's challenge. 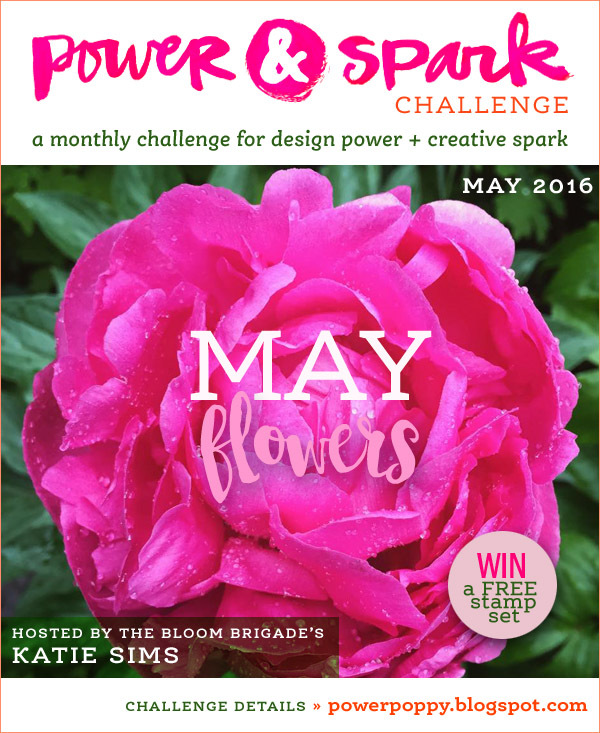 Check out how you can participate in their challenges for free digis on their blog. 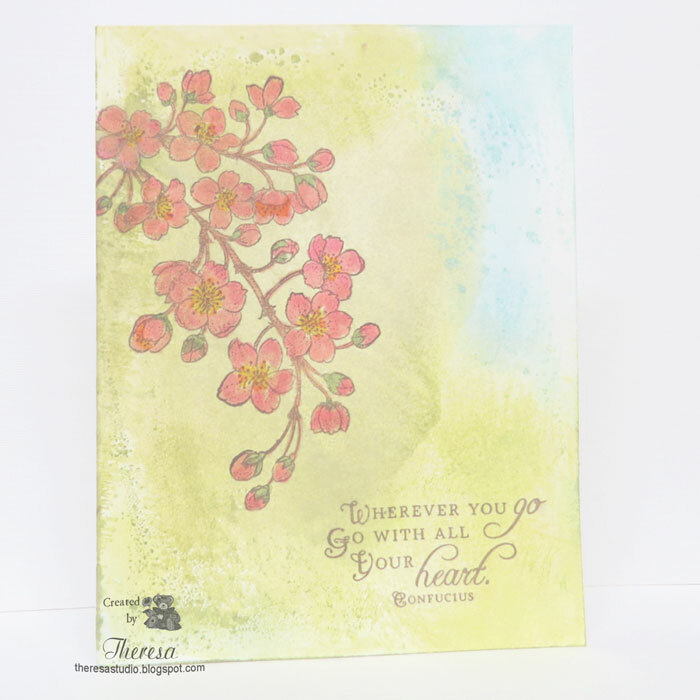 After printing this digital image and sentiment, I colored with Copics and Glaze Pens and assembled the card with a white card base and panels of Graphic 45 Secret Garden pattern papers. I used the From the Heart sketch shown below. I added an Orange Butterfly button from my stash. From the Heart: Digital Stamp Challenge of the month-use Hamlet Pigwit in the Planter. 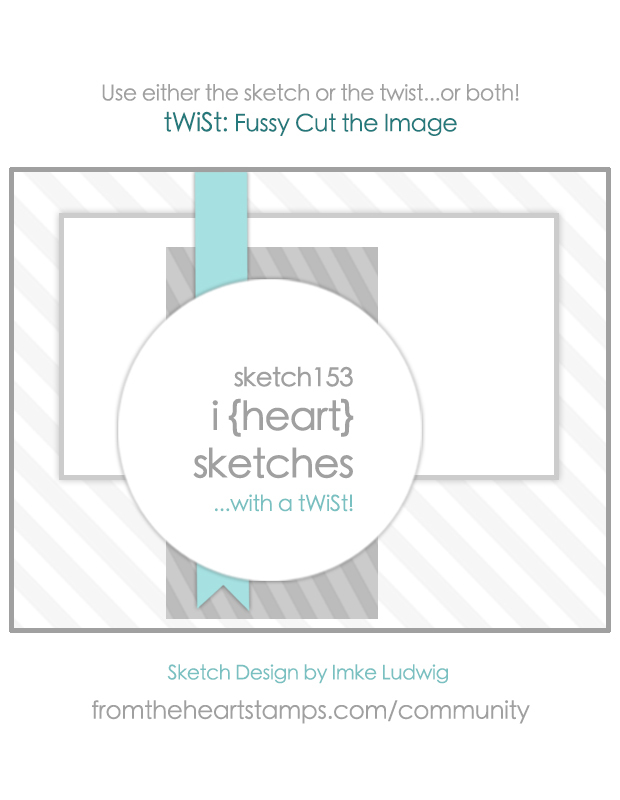 From the Heart: Challenge #150 I (heart) Sketches with a tWist use a button or bow. I added a butterfly button. Welcome! When I saw the Photo Challenge at Just Add Ink, I thought of my Darice EF Chevron and pulled out some Cardstocks close to the colors in the photo. I embossed panels of 4 colors and then "fussy cut" along the zig zag lines of the embossing and overlaid the panels to resemble the afghan in the photo. 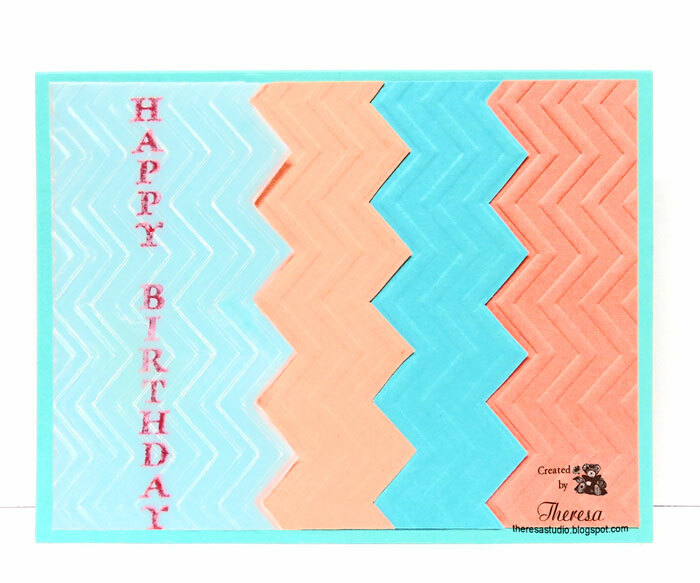 I stamped a panel of Clear Vellum with Repeat Impressions Happy Birthday vertical stamp using SU Cameo Coral ink and heat embossed with Clear EP. I then also embossed the vellum and trimmed the edges and laid over the panel on the left. I like the frosted look this gave to the left panel. This was attached to a card base of a lighter hue of turquoise. Time Out Challenges: Celebration with die cutting or fussy cutting. It did take some fussy cutting to trim all the edges.